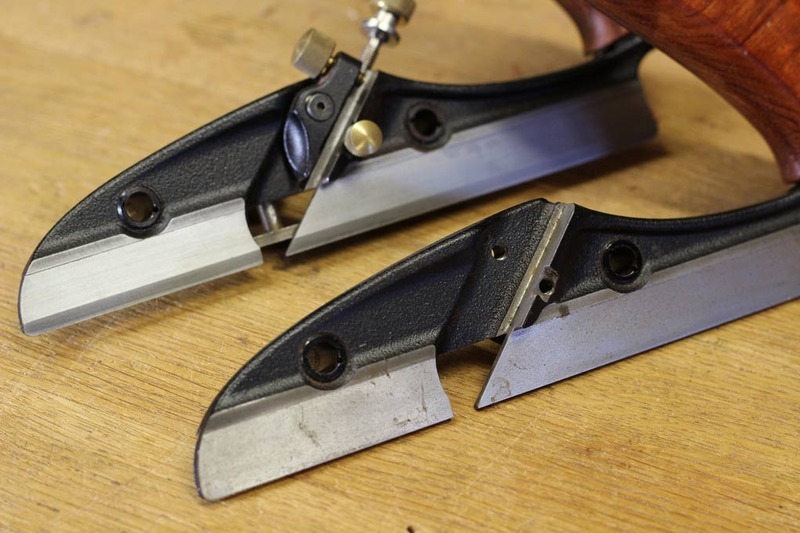 Some months ago, Lee Valley released an upgrade for the Veritas Small Plow that included an improved depth stop and a modification to use the plow as a beading plane. The modification involved the factory machining a bevel on the skate. I presume that this is to enable the skate to follow inside the path of the narrow land of the bead. Lee Valley offered a inexpensive and fairly painless process for those wanting to upgrade their Plows - simply send the basic shell to the factory, and they would machine and return it. Out in the Antipodes, and other non-American lands, this process was not available as the higher shipping costs were a factor. Quite recently, Lee Valley came up with a solution for us, whereby they would simply send out a new, machined body shell to reduce shipping costs both ways. I was undecided whether I would have the modification done. First of all, I prefer planes that do one thing and one thing well, rather than Swiss Army Knives. I already had a Stanley #45, and rarely use it (it is more interesting to look at). Besides, I have used the beading blades on the #45, and they are only successful on straight grained woods, preferably of the softer type. Beading with the #45 on quarter grain Tasmanian Oak .. The interlocked grain on the typical Australian hardwoods I work with are really unsuited to a plough-turned-beader. 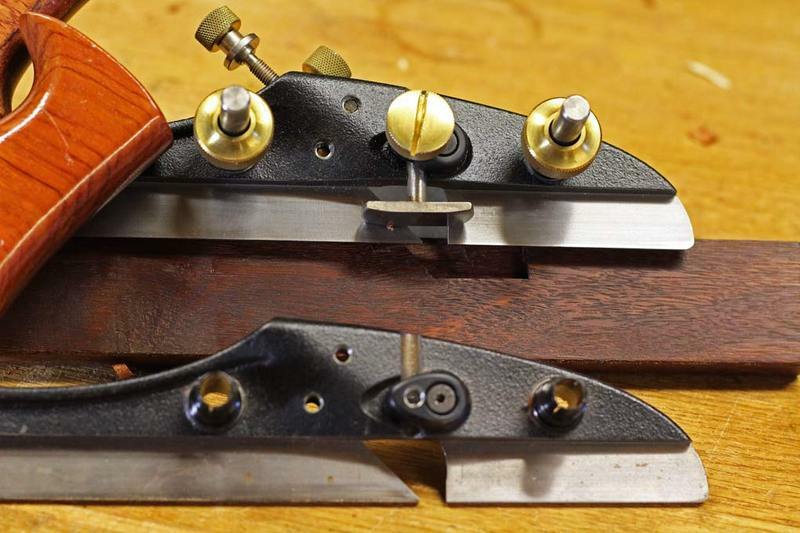 Then there was the set of beading planes I have recently restored for use - another reason why the Small Plow mod was not a good idea. At least they have a closed mouth to hold down the wood. 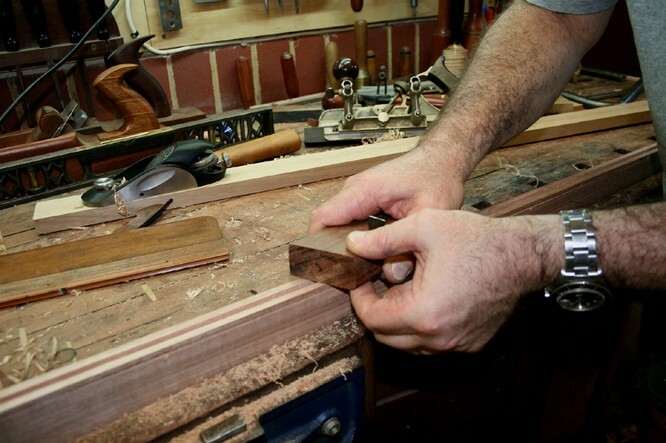 Most of all, I use scratch stocks and make my own cutters. And another old photo .. However, I was curious, and so I sent off for the new, ubeaut, updated Small Plow, and ordered the beading blades (which are PM-V11 steel). Step one was to test out the Plow on a scrap of Makore (left over from a recent build). I was interested to see what type of finish I could get using a slightly interlocked grain but one with grain that was mainly predictable. Pop in a newly-sharpened 3/16" blade (they come 1/8", 3/16" and 1/4"). This is no different to set up than a standard plough blade. Planing with the grain, the finish was crisp and free of defects ..
Now I turned the board around and planed against the grain. The result was massive tearout, as expected ..
OK, so here is the plan: I would use a Stanley #45 beading blade of the same size as the guinea pig. This is identical in thickness to the Veritas blade, just longer. 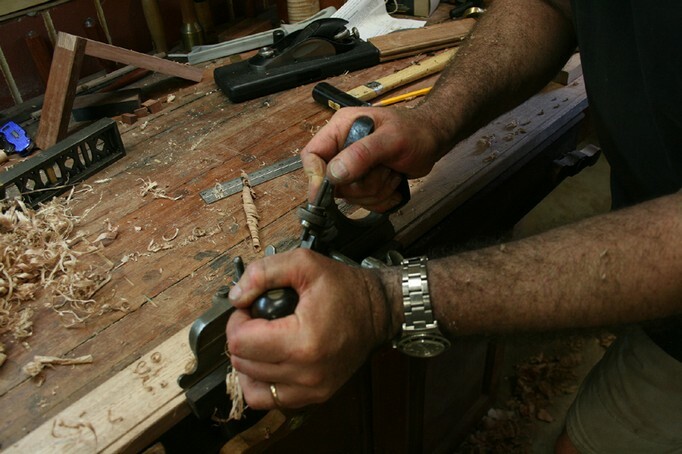 The extra length means that I cannot use the adjuster, and will need to set the depth of cut by hand. What will be different about this blade is that it will receive a 15 degree backbevel. That will create a 60 degree cutting angle! 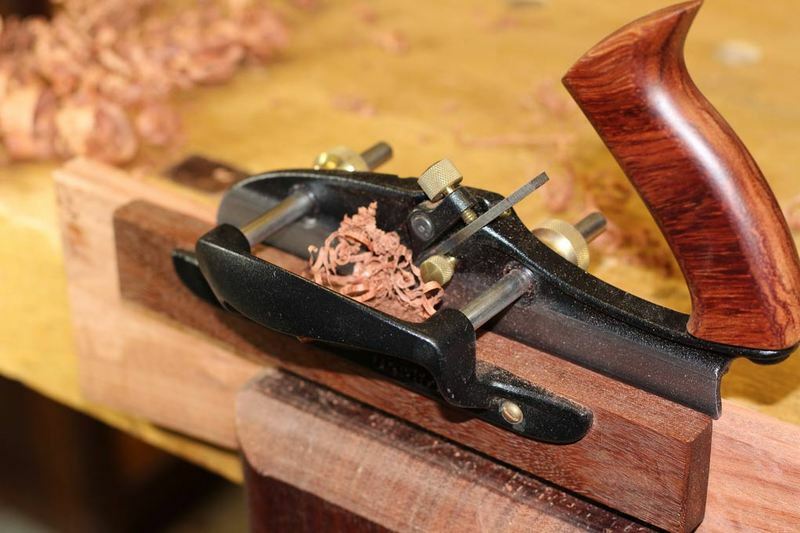 A high cutting angle of this magnitude no longer requires a mouth to control tearout. 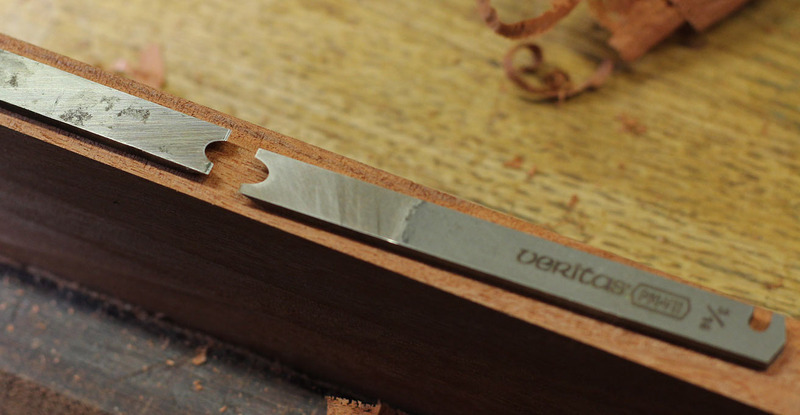 I used a honing guide for the backbevel (Veritas Mk II with small blade attachment, but you can use any honing guide). 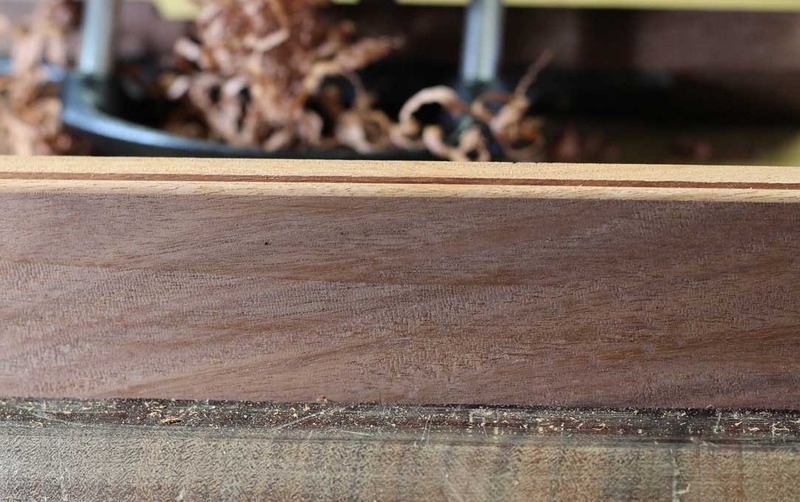 The back of the bead does not need a backbevel, but you can add this using 2000 grit wet-and-dry attached to a dowel if you are in the habit of ploughing deeper than the top of the surface. The tearout comes from the "flats" (or lands, as I referred to them). This is illustrated above. The backbevel stops the tearout. The back of the blade appears to do minimal cutting if you set the depth stop to finish the cut this way. 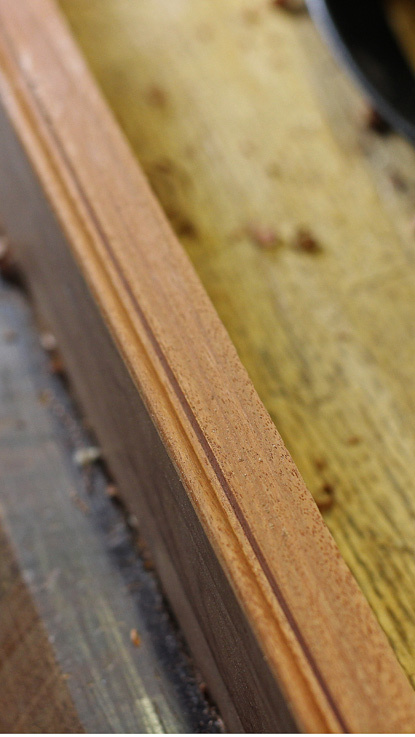 The sides of the hollow are cutting on a skew. 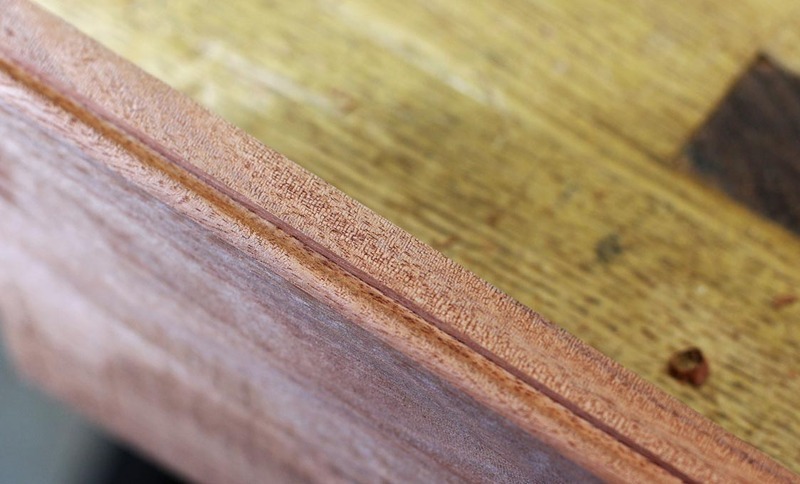 The backbevel is about 0.5mm wide. It is only on the flats. That is where the tearout occurs. A high cutting angle there prevents the tearout. 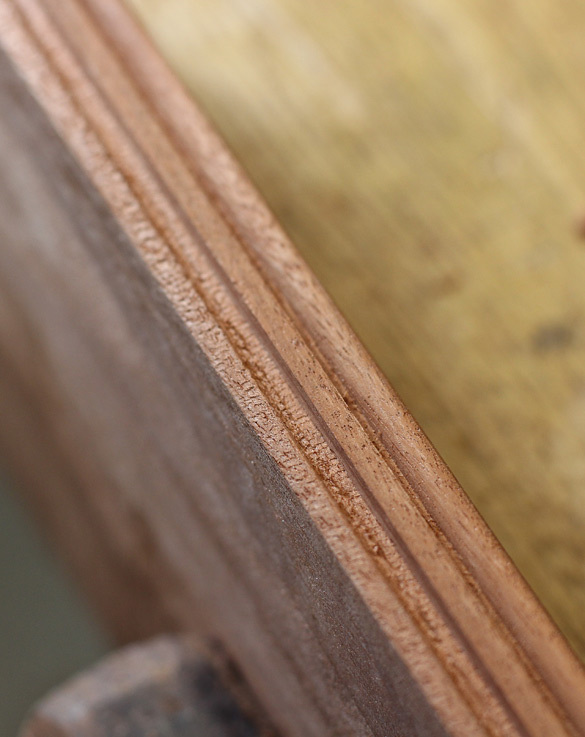 You can backbevel the hollow at the baseline with a dowel and 2000 grit sandpaper, but this is not necessary if you set your depth stop to end at the tip of the final thickness. 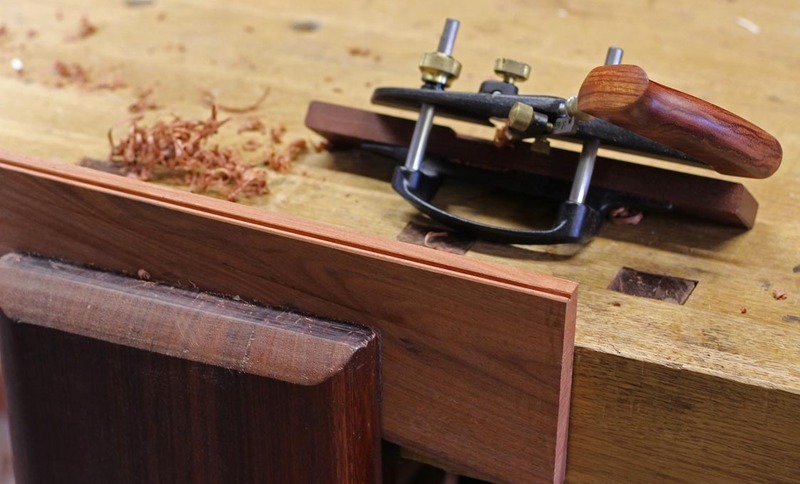 The insides of the bevel are cutting on a skew. And the finish is pretty good! 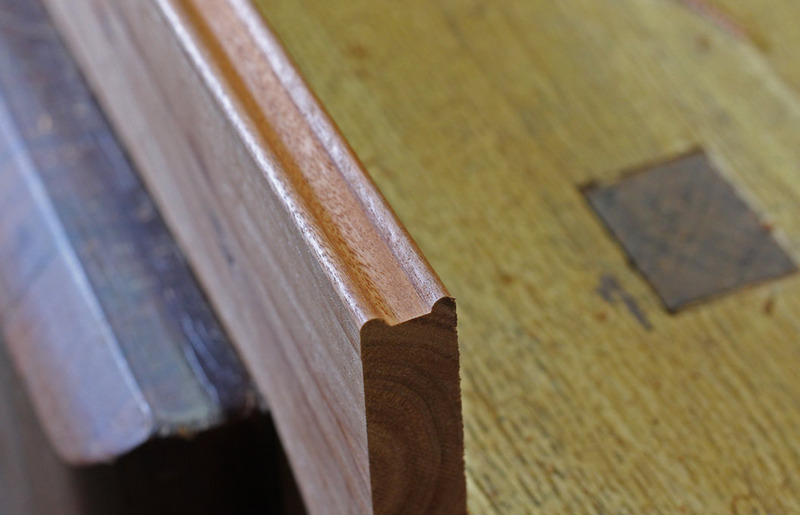 (alongside the bead you will see the tearout in the board that came from flattening it with a jack plane) ..
After satisfying myself that the backbevel was a Good Idea, the Veritas blade went the same route. This time I planed both ways ... both with- and against the grain. In summing up, based on my small experiment, I think that the modification to the Small Plow looks like it will be worth the time and small cost ... if one also uses the blades with a backbevel. Of course, this advice extends to the #45 as well. The nice thing about this mod is that it is now really just a couple of extra blades. There is nothing to set up. I like it. Try it for yourself.